Jamie Vardy scored twice as leaders Leicester won at Sunderland to move to within three victories of their first top-flight title. The Foxes are also guaranteed Champions League football following Tottenham's 3-0 win over Manchester United. Vardy coolly slotted in the first against Sunderland, before outpacing the opposition defence and tucking home a second deep into injury time. The hosts' best chance fell to Jack Rodwell, who blazed over. Sunderland remain 18th in the Premier League table, four points from safety. Leicester's remarkable surge towards the title shows no signs of slowing up after a battling victory over relegation-threatened Sunderland. Foxes goalkeeper Kasper Schmeichel said there is "no pressure" on his side in the run-in and there were certainly no signs of nerves at the Stadium of Light. England internationals Danny Drinkwater and Vardy combined for the striker's 20th league goal of the season, the first Leicester striker to reach the milestone in the top flight since Gary Lineker in the 1984-85 season. His 21st in injury time was superb, leaving Patrick van Aanholt floundering before going round Vito Mannone to slip the ball into an open net. Claudio Ranieri's men have now won their past five league games without conceding, picking up their 14th clean sheet of the campaign on Sunday. They have lost just three of their 33 league games so far. The supporters stayed inside the ground well after the final whistle chanting "we're gonna win the league" and it now seems only an astonishing collapse will stop them from lifting the trophy. Sam Allardyce's Sunderland side gave a good account of themselves against the leaders, but that is not enough at this stage of the season as they cling on to their Premier League status. They left the Stadium of Light without any points and are 18th in the table, although they do have a game in hand on Norwich, who are four points and one place above them. Centre-back Younes Kaboul, who should have done better with a header in the first half, made 25 clearances in the match - the most by a player in the division this season. And German Jan Kirschoff, patrolling the space in front of the defence, kept key Leicester man Riyad Mahrez quiet, completing seven tackles and gaining possession back 18 times. However, their problems lie at the other end of the pitch, having scored just four goals in their past six games. The result could have been different had Rodwell buried his gilt-edged chance, while top scorer Jermain Defoe, with 12 league goals, was on the periphery for much of the game. Sunderland manager Sam Allardyce: "I can't accept how we conceded the first goal. We allowed Jamie Vardy to play to his strengths. One ball over the top... not coping with that was the reason why we lost today. "Our most costly games were not today. A 0-0 draw would have been good for us. The costly ones were the last three, we should have won all three. That wouldn't have seen so much pressure on ourselves and that is what told today." Leicester boss Claudio Ranieri: "The fans must continue to dream but we must continue to be concentrated and focused. Now we have two tough matches at home, the Champions League is on the table and we have to keep it. We haven't achieved anything yet. "You make this job for the emotion you feel inside, but it is difficult for me to tell what kind of emotion." Sunderland travel to Norwich on Saturday (kick-off 12:45 BST) in a crucial game at the bottom of the table, while leaders Leicester will be looking to take a further step towards the title when they host West Ham the following day (13:30 BST). Match ends, Sunderland 0, Leicester City 2. Second Half ends, Sunderland 0, Leicester City 2. Goal! Sunderland 0, Leicester City 2. Jamie Vardy (Leicester City) right footed shot from the centre of the box to the centre of the goal. Assisted by Demarai Gray. Attempt saved. Daniel Amartey (Leicester City) right footed shot from the centre of the box is saved in the centre of the goal. Assisted by Jamie Vardy. Corner, Leicester City. Conceded by Jan Kirchhoff. Attempt saved. 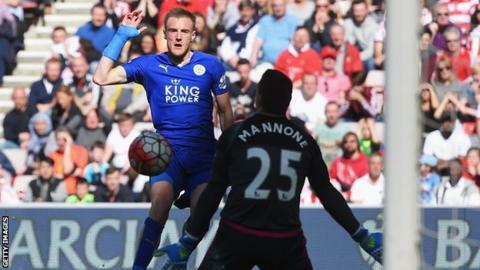 Jamie Vardy (Leicester City) right footed shot from the centre of the box is saved in the centre of the goal. Assisted by Daniel Drinkwater. Attempt saved. Leonardo Ulloa (Leicester City) right footed shot from the right side of the box is saved in the centre of the goal. Assisted by N'Golo Kanté. Attempt missed. Jack Rodwell (Sunderland) right footed shot from the centre of the box is just a bit too high. Assisted by Jermain Defoe. Attempt blocked. Patrick van Aanholt (Sunderland) right footed shot from outside the box is blocked. Assisted by Jack Rodwell. Attempt missed. Jermain Defoe (Sunderland) right footed shot from outside the box is high and wide to the right. Assisted by DeAndre Yedlin. Dame N'Doye (Sunderland) wins a free kick on the left wing. Attempt blocked. Jermain Defoe (Sunderland) right footed shot from the centre of the box is blocked. Assisted by Patrick van Aanholt. Attempt saved. Marc Albrighton (Leicester City) right footed shot from outside the box is saved in the centre of the goal. Assisted by Leonardo Ulloa. Substitution, Sunderland. Jeremain Lens replaces Fabio Borini. Foul by Dame N'Doye (Sunderland). Substitution, Sunderland. Jack Rodwell replaces Yann M'Vila. Substitution, Sunderland. Dame N'Doye replaces Wahbi Khazri. Goal! Sunderland 0, Leicester City 1. Jamie Vardy (Leicester City) right footed shot from the left side of the box to the bottom right corner. Assisted by Daniel Drinkwater. Attempt missed. Wahbi Khazri (Sunderland) right footed shot from the left side of the box is high and wide to the right. Assisted by Yann M'Vila. Foul by Patrick van Aanholt (Sunderland). Attempt missed. Daniel Drinkwater (Leicester City) right footed shot from outside the box is close, but misses to the right. Assisted by Riyad Mahrez. Attempt blocked. Wahbi Khazri (Sunderland) right footed shot from outside the box is blocked. Assisted by Lee Cattermole. Corner, Leicester City. Conceded by DeAndre Yedlin. Attempt missed. Shinji Okazaki (Leicester City) left footed shot from the left side of the box is too high. Assisted by N'Golo Kanté. Attempt missed. Fabio Borini (Sunderland) right footed shot from the right side of the box is high and wide to the left. Attempt blocked. Jermain Defoe (Sunderland) right footed shot from the left side of the box is blocked. Assisted by Wahbi Khazri. Attempt missed. DeAndre Yedlin (Sunderland) right footed shot from outside the box is high and wide to the right. Assisted by Wahbi Khazri. Attempt missed. Fabio Borini (Sunderland) right footed shot from outside the box misses to the left following a corner.